With the Managers in Partnership Television Media Market (MIPTV) continuing in Cannes this week, both John Barrowman and Bill Pullman have been in demand for their thoughts on the development and filming of Torchwood: Miracle Day. This is a huge thing for us, this is huge thing for me, and it's huge for the BBC, huge for Starz, so it's - if I use the word on a global sense - it's just incredible. I arrived here in Cannes and at Nice airport people were waiting for my autograph, that's not happened to me before. To do all the paparazzi, photographs, to do all that kind of stuff, it's a big change for us. I'm used to being a - I use the word 'celebrity' - in the UK and some parts of the US, but this is becoming global now - and I'm loving every minute of it! I get to do some wonderful scenes with Bill; we're bit of a pair of jokers off camera and we're having a really great time, spending time with each other. But on camera, the characters of Jack and Oswald, they don't like each other, but they really do - because they see something in each other that is recognisable. Our scenes are all very heavy, with a little bit of twist in them each time. It should be exciting to watch, but I'm working with the President of the United States, for goodness sake - come on, how more exciting could that be! This is the kind of story that I think is why I enjoy science fiction the most, when I like it the best is when it's an allegory for what it is to be human and not just learn more about how much the aliens look like insects! There is something kind of wonderful about this role in that I climb from a relatively dark little nasty corner into a global spotlight and look to morph myself to accomodate that stage. So it is as much about someone who is recognising a need for a leader and becoming the person he has to become, more out of opportunity and then waiting to see what happens internally. It's not just a villain who is just stamping everything with black. I've been impressed by the casting, you Brits have a very nice pool of actors with a consistency all the way down the bench, shall we say, so the smallest parts provide a certain kind - to me - of good quality. I've been glad to see the actors that they've been casting have been from a great range of things and they have a lot of texture and soul. We're taking the Welsh global - retaining the best of British drama while learning all about US production values. Previously, America was represented in our stories by two people in US military uniform. 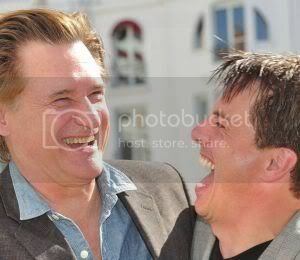 Now we can tell a truly global story with actors of the calibre of Bill Pullman. There is so much more we can do with Torchwood now having made the leap to America. It’s going to be even bigger and better. And, for me on a personal level, the move to America has been amazing. ... the audience is going to need a forklift truck to pick their jaws off the ground. The stunt work is unbelievable. I used to do quite a lot of stunts except if it was jumping off of buildings but now I’m not allowed to because of the insurance policy. I’m much more valuable in America! Among the tweaks on the show, Captain Jack’s iconic RAF coat has been “re-booted” with a lighter weight material and a “slimmer cut.” According to Barrowman, the former was to account for LA’s hotter weather, while the latter was the decision of the designer (Shawna Trpcic), not him. It helps us reach some scale. We've had for the first time the opportunity to shoot both in the U.K. and also in America. We are doing bigger stunts. We are able to create more action. We have more background artists. So there is an onscreen value. The single most important thing to say is, at heart, the show remains the same. We haven't been asked to change it. We haven't been asked to be 'American', whatever that means. Both Starz and BBC One have asked us to make the best quality, most bold offering of Miracle Day that we possibly could.